This family favorite recipe is quick and easy in the Instant Pot! 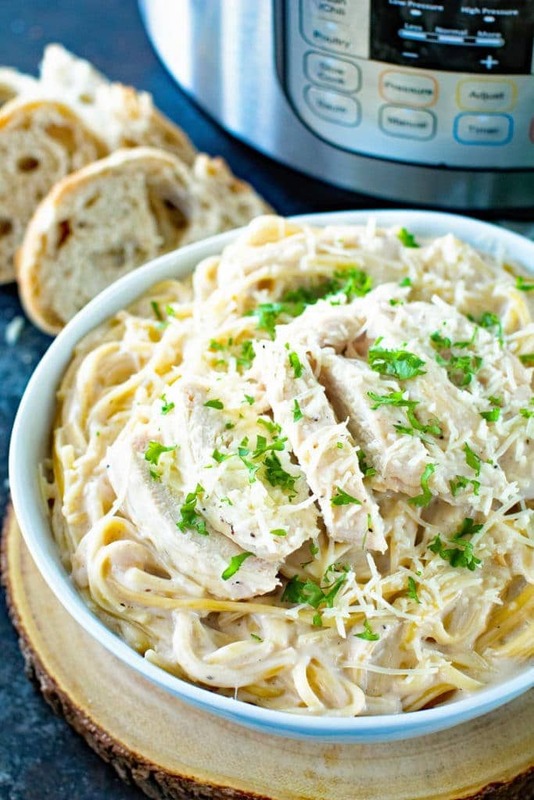 Everyone will love this Instant Pot Chicken Alfredo and it will be ready in 20 minutes with only one pan dirty! Add this easy pressure cooker recipe to your menu today! 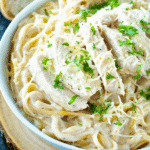 Chicken Alfredo made in your Instant Pot! Can I get a heck yes? It’s as easy as my Instant Pot Spaghetti and just as wonderful. Literally 30 minutes or less and it’s done. 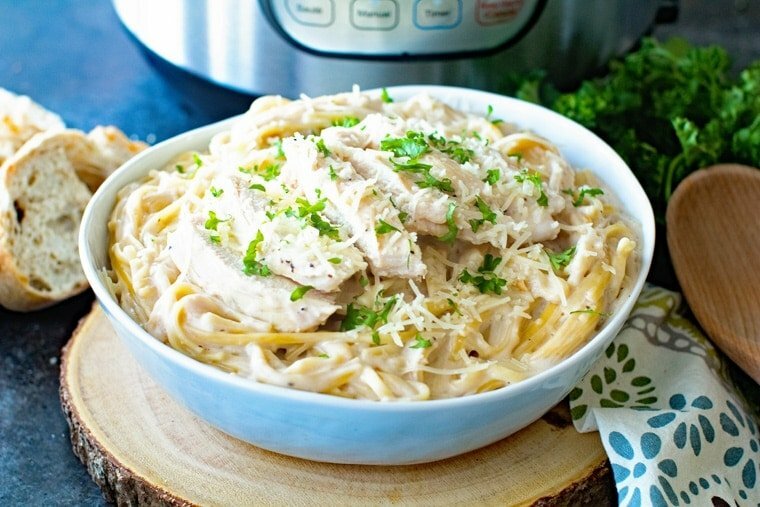 You won’t regret trying out this Instant Pot Chicken Alfredo for dinner tonight! You all have been loving the Instant Pot recipes lately and I need to get on making more of them! These French Dip sandwiches that I made in my Instant Pot are the latest hit. A lot of people ask me what the big deal is about the Instant Pot and if they really need one. I tell them they don’t NEED one but it sure is handy. You can live without it but if you want something to make dinner easier it’s a great investment. I love that most of the recipes require minimal babysitting while they cook. You just throw the ingredients in and let it cook and it magically is done. I need this after work when the kids are hanging on my legs, homework needs to be done and Mom is three seconds away from losing her mind. Been there? I also know a lot of you say you forget to thaw meat out and then don’t know what to make for dinner. You can totally cook frozen meat in an Instant Pot! Another popular question about pressure cookers is the comparison of it to a slow cooker. Why do I need a pressure cooker if I already have a slow cooker? The main difference is that you let your slow cooker cook all day. The pressure cooker requires minimal cooking time and gets similar results as the slow cooker in my opinion. When thinking about purchasing a pressure cooker you have to ask if you would rather put your meal in the slow cooker at the beginning of the day or middle of the day and let it cook or if you’d rather come home and throw the recipe in a pressure cooker and let it cook for approximately thirty minutes. Grab the FREE Cheat Sheet here!! That’s really the big difference. Some people like coming home to the meal mostly done cooking and ready to go. I was like this when I was working outside the house. I just would rather take the time in the morning to mix it up and then come home to the meal almost done because my kids are always starving the minute we walk in the door. Other people don’t want to take the time in the morning or they are at home during the day and don’t want to smell the food all day (that would be me!) so they prefer the pressure cooker method of cooking. I love that it essentially dirties only one pot too! You can saute your meat or brown it and then add the rest of the ingredients. WIN! Can’t get much easier than this! 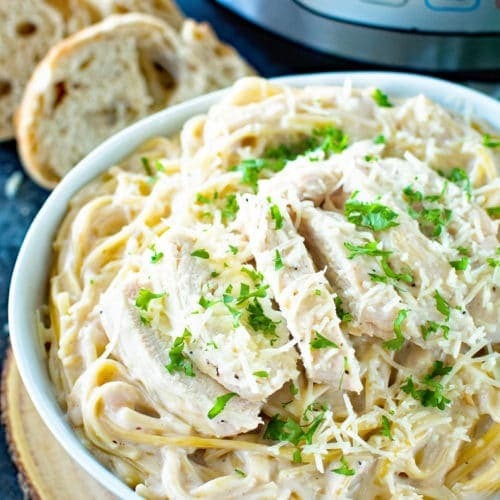 30 minutes and seven ingredients later you’ll have delicious pressure cooker Chicken Alfredo! Another one of our favorite quick recipes is Chicken Breasts in a delicious mushroom cream sauce. Turn on your Instant Pot to Saute and then add oil. When hot add chicken breasts. Brown on each side 2-3 minutes per side. Add the rest of the ingredients. Give it a stir and try to get all the fettuccine noodles covered. Turn Instant Pot to High Pressure for 8 minutes. When 8 minutes is done quick release pressure. Remove chicken and cut. Add back to chicken Alfredo mixture and stir. This family favorite recipe is quick and easy in the Instant Pot! 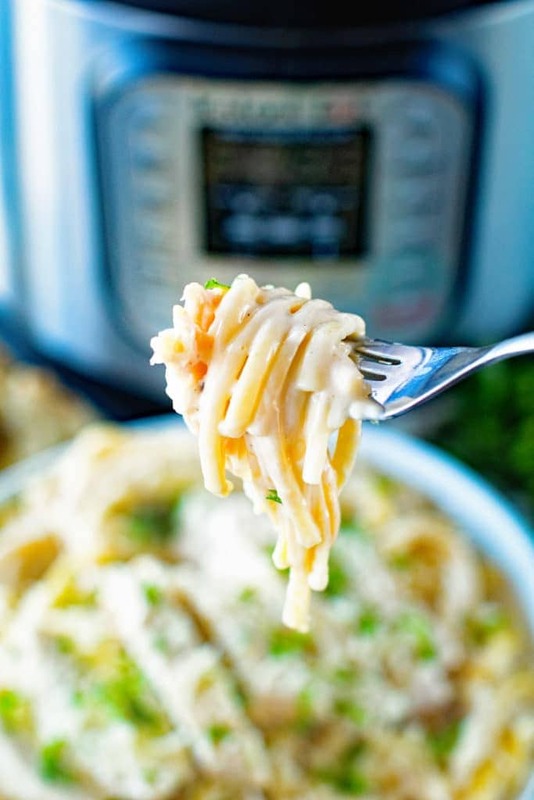 Everyone will love this Instant Pot Chicken Alfredo and it will be ready in 30 minutes with only one pan dirty! Add this easy pressure cooker recipe to your menu today! Add olive oil to instant pot. Turn instant pot on to saute function. Place chicken in pan when the oil is hot. Brown chicken on both sides, about 2-3 minutes per side. Add the rest of the ingredients to pressure cooker. I break my fettuccine noodles into 1/3's and then try to stir it to get them in the liquid so the noodles don't get hard during the cooking time. Turn to high pressure for 8 minutes and let cook. When done cooking quick release pressure (I cover with a towel because the release valve can spray starchy water when cooking pasta). Let sit 5-10 minutes for sauce to thicken. Remove chicken during this time and slice. Add back in and stir. Serve. Could not be easier or yummier! Love Alfredo! Me too! Can never turn it down! This looks like an amazing meal that I’m sure entire families will love! Yes! The entire family always loves this one! 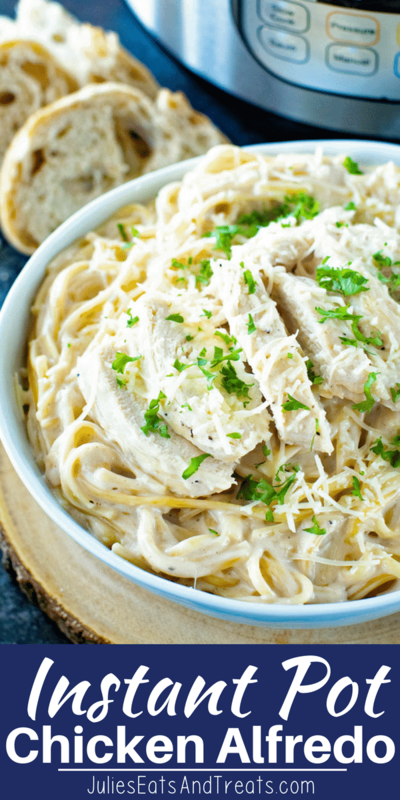 Chicken alfredo is a staple at my house!! Mine too! Something everyone always likes! This is the second meal I’ve made in my new InstaPot. It turned out delicious! I will definitely be making this again. Thank you! After the 8 mins you do the quick release and keep it cooking or do you turn the instant pot off and put it on the keep warm function or what? Quick release after 8 minutes then turn it off and let it sit. You can even remove the pot from the Instant Pot so it cools faster and the sauce thickens up quicker! I dont think 2 cups of water was enough for my batch. My unit gave me an error and the sauce was dry. Do you cook for the same amount of time? How would I make it with frozen chicken breasts? I’m not sure you can because you’d need to increase the cooking time and the noodles might be overcooked at that point. After searing the chicken do you remove it from the pan? Or do you leave Chicken in with the sauce and noodles? Do you know what the changes would be for a full pound of pasta instead of a 1/2 lb? Thank you. You’d have to double the entire recipe, not sure if it would work in the pressure cooker or not! Would you still use 8 oz. of any other type of dry pasta (farfalle, penne, orecchiette)? I would think so, I haven’t tested it that way though. Has anyone doubled this recipe? How did that turn out?? Thanks for letting us know how it works when doubled. What size of IP did you have? Hey Cathy! Did you ever make this double batch in your 6 quart? Hoping to do it tonight and was wondering the same thing! Thank you so much ! I tried this recipe in my insta pot. I could never get it to reach pressure before it would start beeping, and display the word burn. I followed your directions to a T. I also made sure the little wire thing used to pressure cook meat was in. I ended up trying to finish the cooking in the oven. Over all I pretty much wasted food. Is there a special insert or step that maybe wasn’t mentioned used to prevent the burn display? Hi, I’m curious what metal wire thing you use for cooking meat? I’ve never heard of this before. The metal rack that came with it. It’s the only accessory that my instapot came with, although I have seen where you can buy steamer racks as well as other things. Ah I understand now. I typically don’t use that for meat. In most recipes the meat is cooked mixed with the other ingredients, as it is in this one. As for your burning issue, my guess would be that you need to scrape the bottom of your pot after sauteing the meat. It’s not mentioned in the recipe, but it’s definitely something I do after I saute anything in the pot.